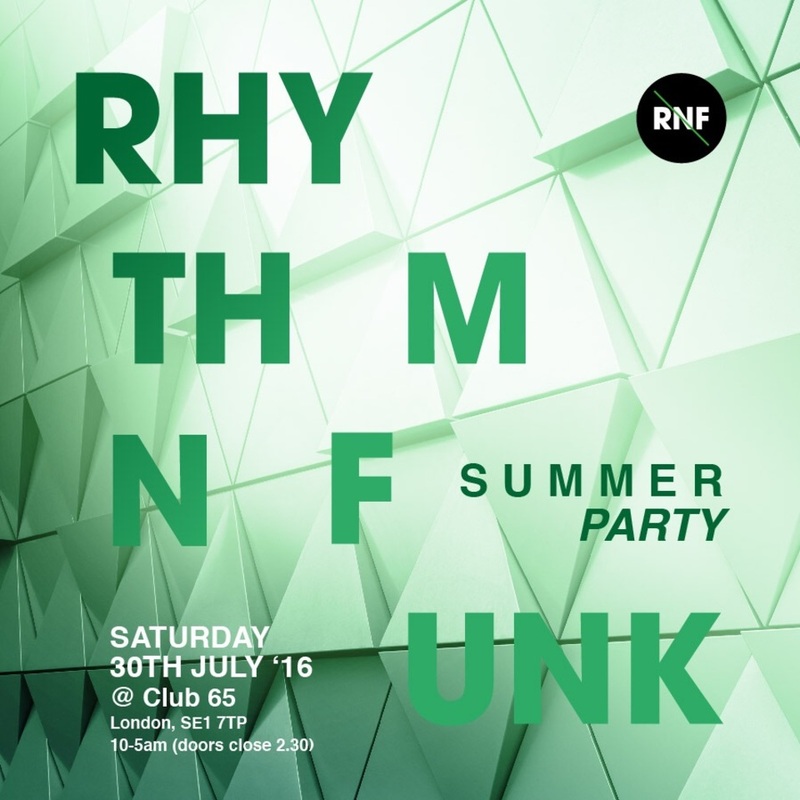 Rnf returns for its annual birthday celebrating 11 years as one of londons favourite party’s. Limited free birthdays between May 1st- May 31st go free . 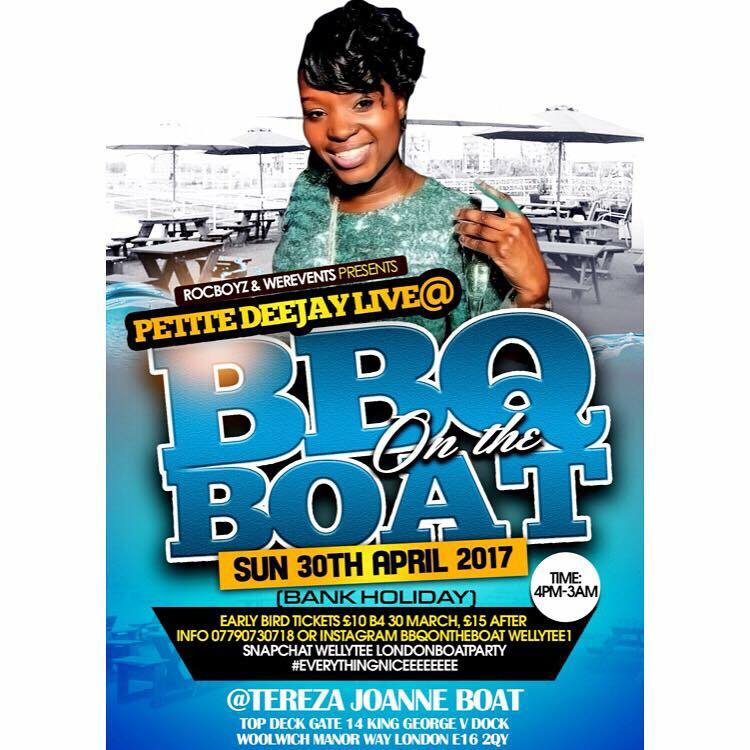 Welcoming DJ Cndo LIVE from South Africa to celebrate the birthday’s of Welly Tee and Petite Deejay at Welly Tee’s annual Boat Party. A day and night full of typical South African food and music. With South Africans, Brits and lovers of South African House joining in the April birthday celebrations. 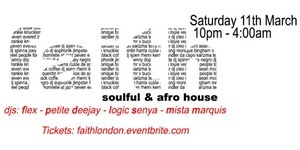 #FaithLdn launched back in 2008 as a solution to what was at the time, a very saturated ‘Funky House’ scene. 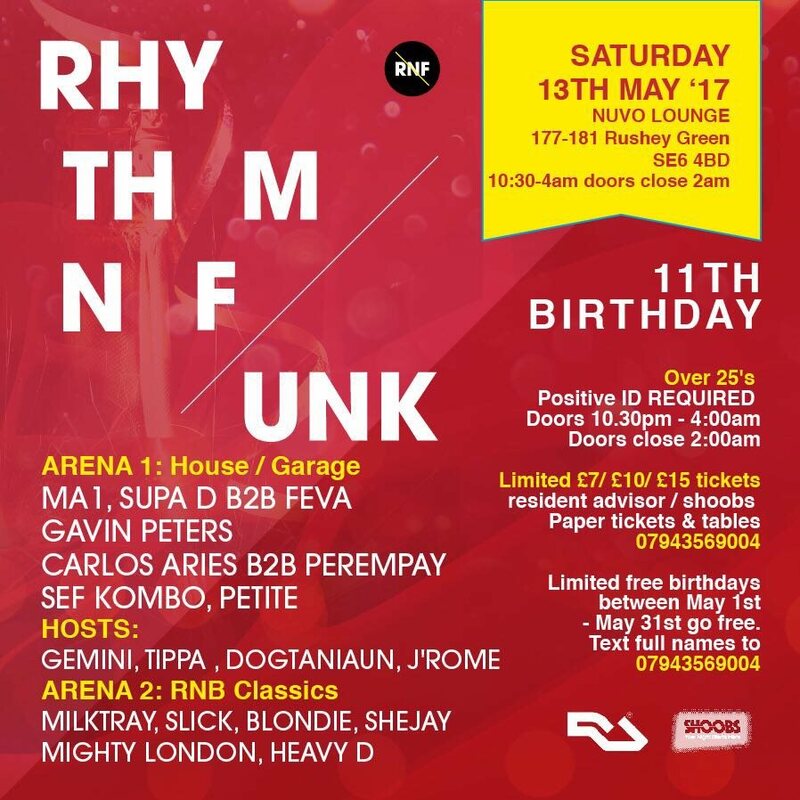 During a period where many promotions were focused solely on ‘Funky’, we brought soulful and deep house to a mature London crowd. On Friday 21st October 2016, we returned with our 1st party after a hiautus that lasted over 7 years. To say the party was a success was an understatement. With less than 2 weeks notice, we managed to get a full house and the vibes were something else. Focusing primarily on South African House, we danced hard ALL night. We’re thrilled to announce that the has been set for another night of soul stirring, spirit lifting sounds. Dresscode: Casual but please make an effort. No sportswear. Nearest station is Old Street (underground). For our last party of the Year we have a wonderful treat for you, we will be joined by our longest hosts… Mixed Emotions Music (M.E.M) dynamic duo Nick Fernandez & David Bailey, alongside their special Guest Mathew Ballester. 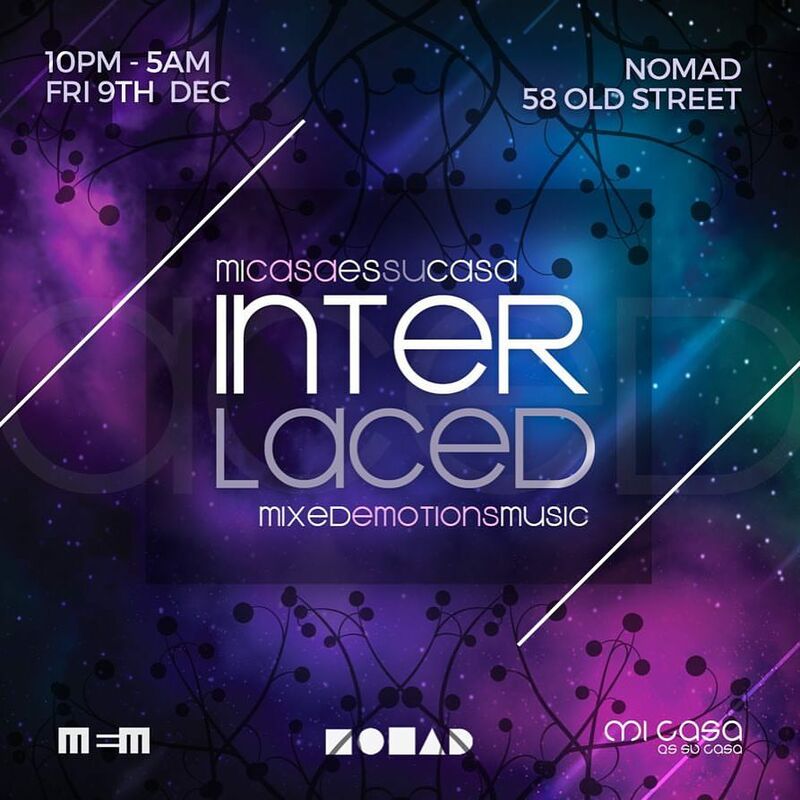 Down in the Lounge Bar, Mi Casa takes over the space and brings you another amazing line up of gifted performers: DJs Ean, DJ Westy (debut set at InTeRLaceD), Gary ‘Gee’ and Petite Deejay. 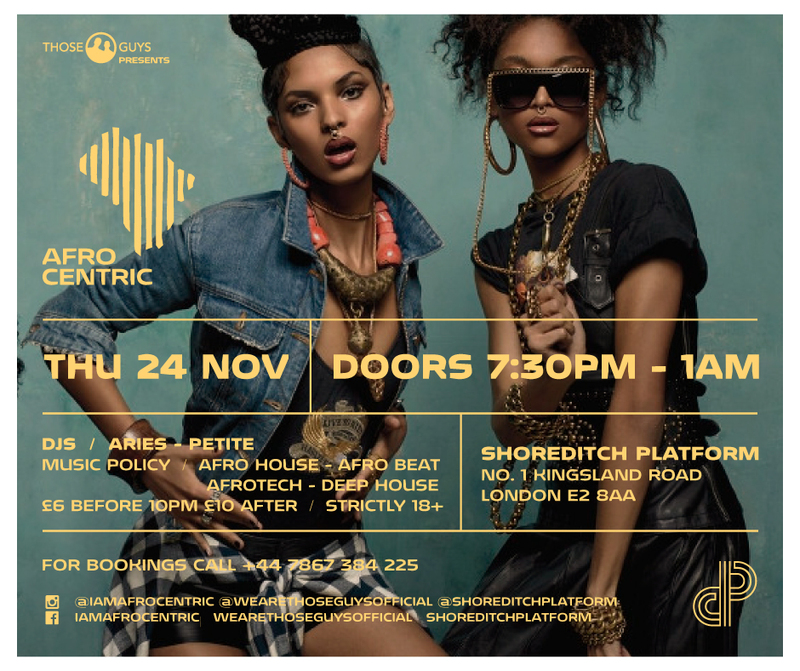 AFROCENTRIC is a monthly Afro House night featuring the best international and local DJs representing the ever-evolving House Music scene. 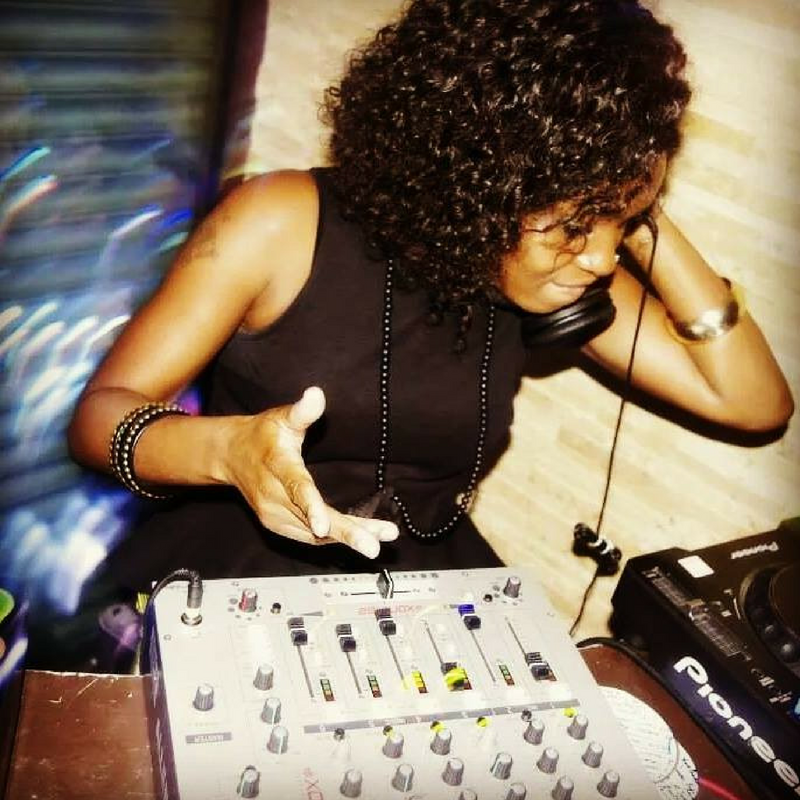 And the global griot DJ Aries who’s supported top house DJ’s DJ Afrozilla and Culoe De Song, delivers her signature blend of Deep Tech and Global House sounds PLUS a special guest. 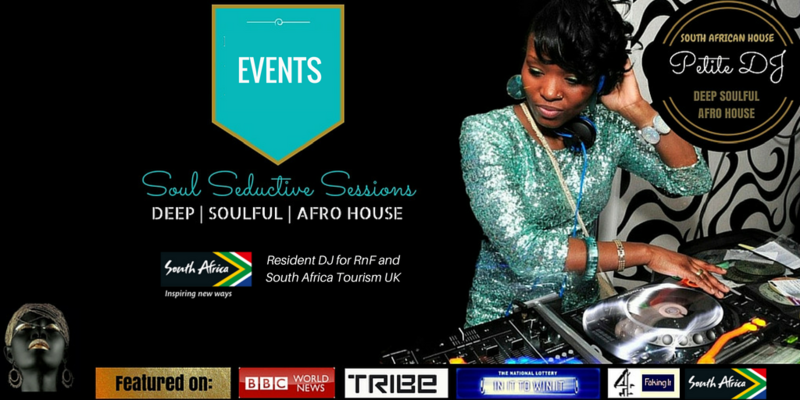 Our mission is simple; Afro House that is accessible to all dance music fans, no matter their background. Afrocentric – Music For The People. 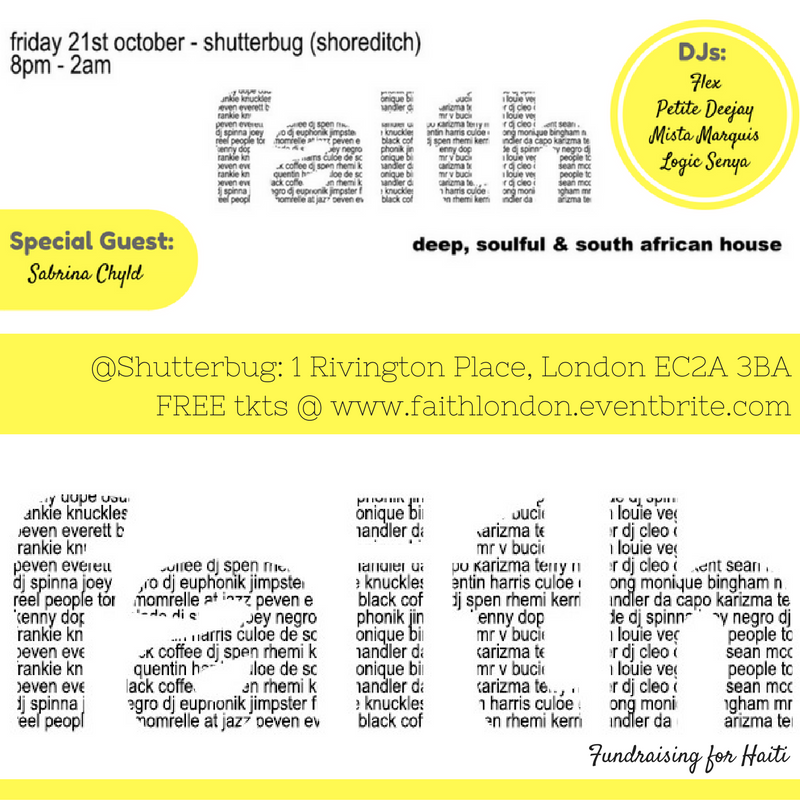 Join us on Friday 21st October as we return with our 1st party in over 7 years. This return will be a bitter sweet moment for us as Shutterbug will be closing down at the end of the month. This means this will be our first and last Faith there. It is a great little spot where many house events have been held and a place were some great memories were made. We hope you can join us as we celebrate our return and also give it’s rightful send off. 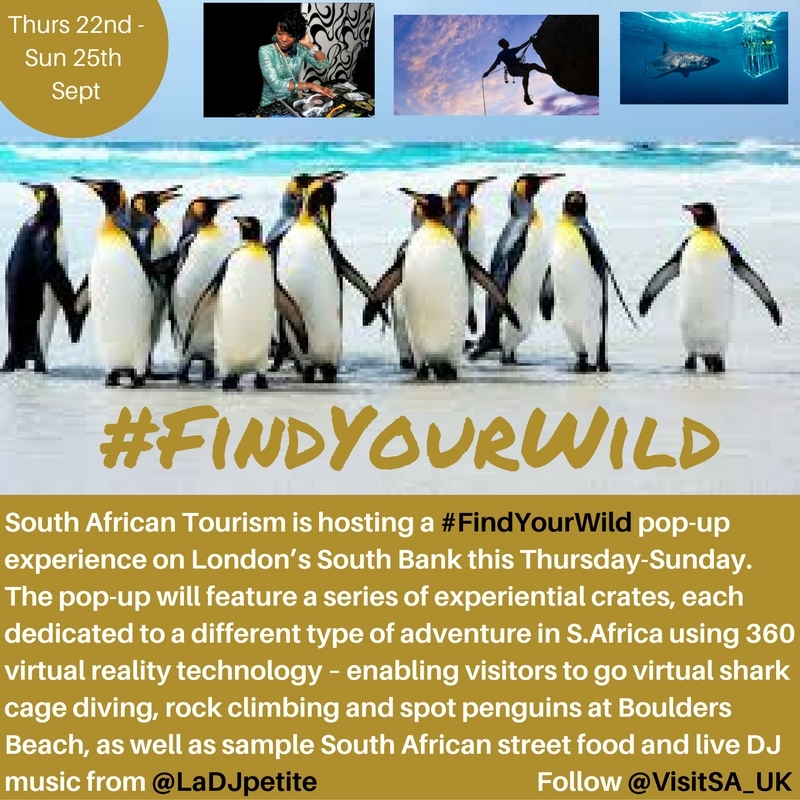 South African Tourism (SAT) is hosting a #FindYourWild pop-up experience on London’s South Bank from 22-25 September. The pop-up will feature a series of experiential crates, each dedicated to a different type of adventure in South Africa using 360-degree virtual reality technology – enabling visitors to go virtual shark diving, rock climbing and spot penguins at Boulders Beach, as well as sample South African street food and live DJ music from Petite Deejay. Visitors to the pop-up can enter a daily competition to win flights to Cape Town with British Airways alongside various activities to do in South Africa including spa treatments and a trip up Table Mountain. There is also a Panasonic Lumix camera to be won daily plus a grand prize of a holiday of a lifetime to South Africa. The #FindYourWild experience will be located opposite the ITV Studios on Southbank and will open Thursday from 2pm-8pm, Friday and Saturday from 10am-8pm and Sunday from 10am-5.30pm. The pop-up will be open every day from 10am-5pm for visitors to see work from Gentlemen of the Road photographers Marcus Haney, Chris Mass, Ty Johnson and David East – as well as some of Ted Dwane’s own photos from the road. A special one-off commission by @JJ Adams will also be featured at the exhibition, along with new pieces from South African artists Lyndi Sales and Lionel Smit. 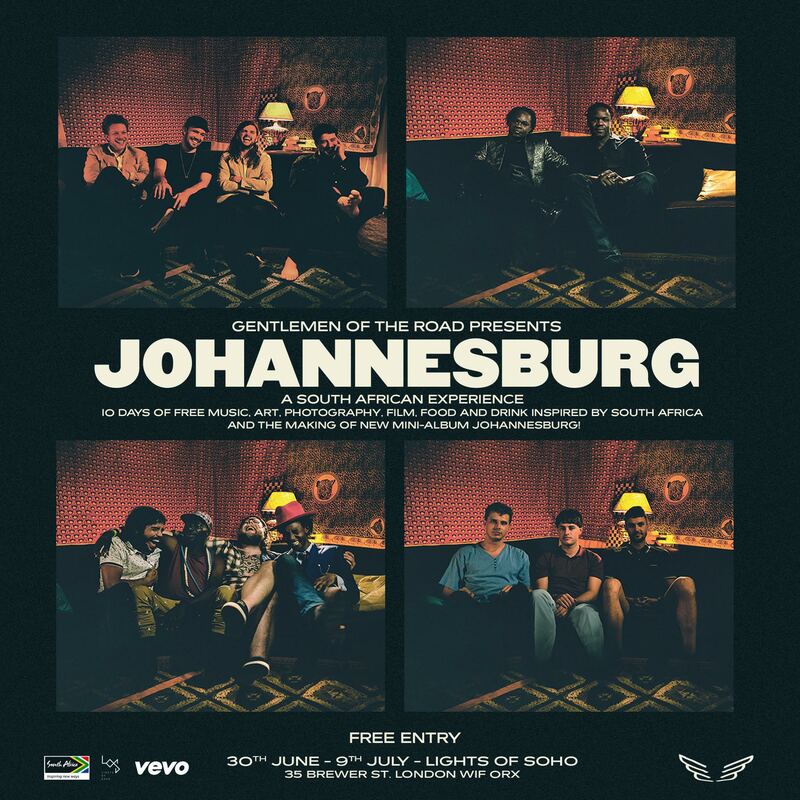 Presented together with South African Tourism UK and Vevo. FRI 1st JULY – SAFFA SOUNDS – DJ sets from Cape Town’s genre-defying Petite Noir & DOkzharp. SAT 2nd JULY – AFRO DANCE PARTY – Petite Deejay on the decks again playing the best in South African house and Cosmo and Pablo serve up African music from the 60’s to date. 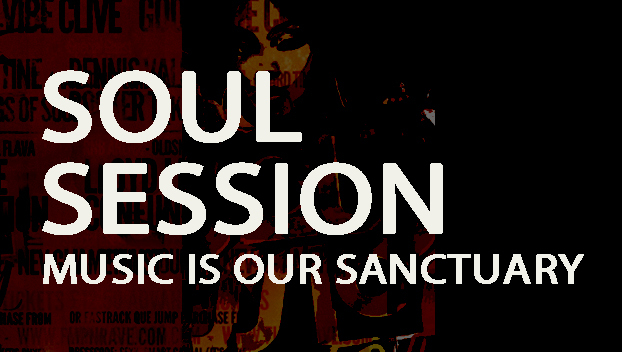 Come and join us as we unwind for the week ahead with a selection of Deep Dubby Soulful House. Focused on the beautiful Deepness of House, we have a selection of DJs, horns and drums to take you on a journey through Deep House including Tech, Afro and Soulful Sounds. For those who want to continue the night, feel free to join us for an additional instalment nearby. Subscribe to be notified of where I'm at!